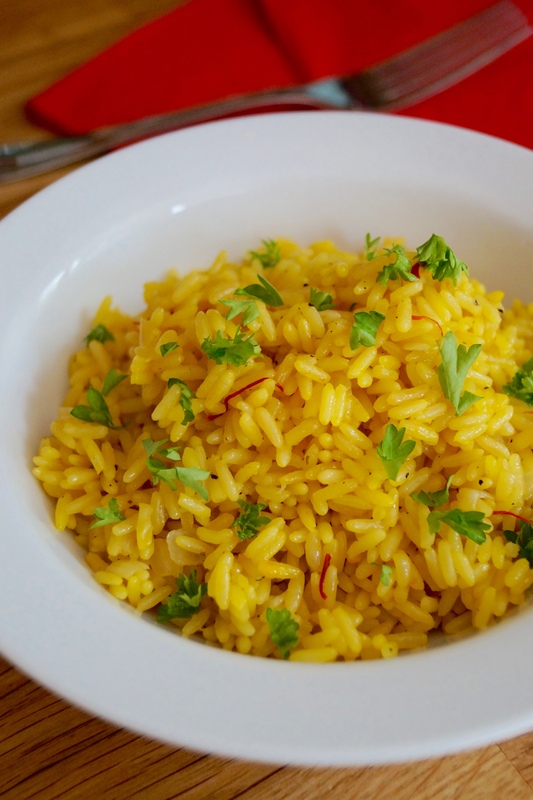 Fluffy aromatic buttered saffron rice. A classic and delicious side dish. I absolutely adore simple and easy dishes. They’re especially convenient for busy working families with hardly any time to make a delicious and tasty dinner. Rice dishes in particular are a great standby for hectic weeknight dinners. Rice is a basic store cupboard ingredient and my recipe proves it can be transformed into something special with just a handful of extra ingredients! This rice is amazing and it’s always a big hit with my family. It’s quick to make and with a buttery and fragrant flavour it makes a tasty side dish that is luxurious and will impress any dinner guest who tastes it. I decided to combine one of my favourite ingredients in my herb and spice cupboard, saffron. 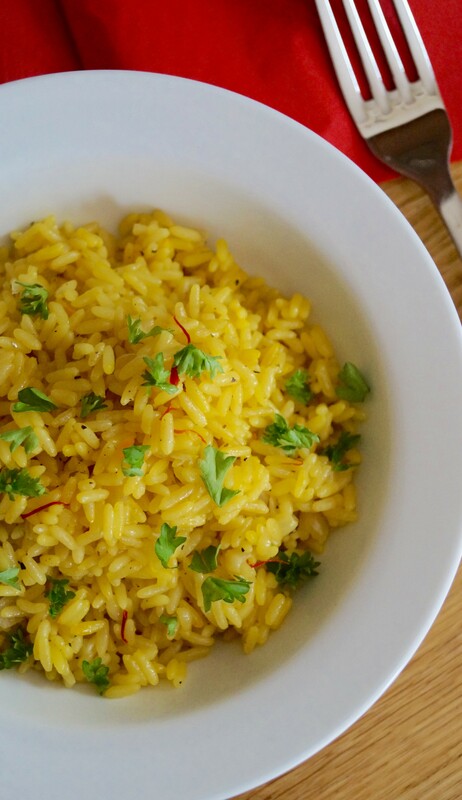 I often use saffron in my Spanish recipes like paella (recipe for that will be coming soon!) and homemade sauces. 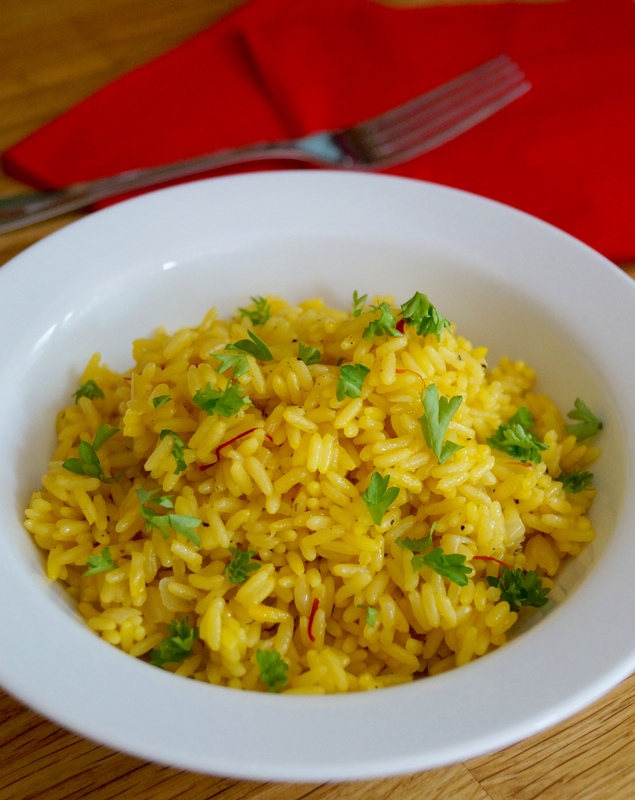 This rice recipe is very adaptable as you can add a small handful of cardamom pods, cloves, a little pinch of turmeric and a cinnamon stick and easily turn the recipe into pilau rice ready to serve with your favourite curry. I’ve been making and creating my own rice recipes for a little while now. I shared this amazingly good One-Pot Mexican Rice recipe a while back when I’d just started blogging and it still remains one of my favourite dishes. The rice is speckled with beautiful saffron threads. I love the rich flavour the saffron adds. To prepare the rice it’s very important to have your mis en place prepared beforehand. I take two smallish pinches of saffron threads and I soak the saffron in boiling water for 10 minutes. The soaking allows the oils to be released and the flavour will become stronger. Saffron is the world’s most expensive spice but it can be found at an affordable price if you look around at your local supermarket. Whilst the saffron is soaking you have the opportunity to prepare your other ingredients. I finely diced a small white onion and minced up a couple cloves of garlic. To cook the rice, melt the butter and oil in a large saucepan. Caramelise the onion and then add the garlic and a bay leaf – caramelising the onion again will add more depth of flavour and a little sweetness. Tip the rice into the pan and toast slightly so it can be coated fully in the butter mixture. Then all that’s left to do is to pour in the stock and leave the rice to simmer away until cooked. Once cooked I always take rice off the heat and leave it to rest for another 5-10 minutes. This allows the rice to steam a little longer and makes it fluffier – it’s one of the most vital steps in making perfect homemade rice! Fluff with a fork and then serve up! This rice can also be served alongside many dishes – I love to serve it with curry or my mum’s Spanish roast chicken. But the rice is great enjoyed on it’s own too! I hope you give this a go and most all enjoy it! 1. Add the saffron threads to a small bowl. Pour over the 2 tablespoons boiling water, mix and leave to stand for 10 minutes. 2. In a large saucepan gently melt the butter and oil. Add the chopped onion, season well with salt and pepper and sauté on a medium heat for 3 minutes. Now add the minced garlic and bay leaf and continue cooking for a further minute until fragrant. 3. Add the rice and toast for 2 minutes. Now add the stock and the saffron infusion you pre-made earlier and stir to combine. Bring up to the boil and then once boiling turn down the heat to low and allow the rice to simmer covered for 15 minutes or until all the liquid has been absorbed and the rice is cooked fully. 4. Once the rice is cooked, take off the heat and leave on the side for 5-10 minutes. Fluff the rice up and adjust seasoning, if needed. 5. Serve warm with a sprinkling of parsley. Note: To make this dish Vegan omit the butter and add an extra 1 tbsp oil or 30g of your preferred butter subsitute. Yum! 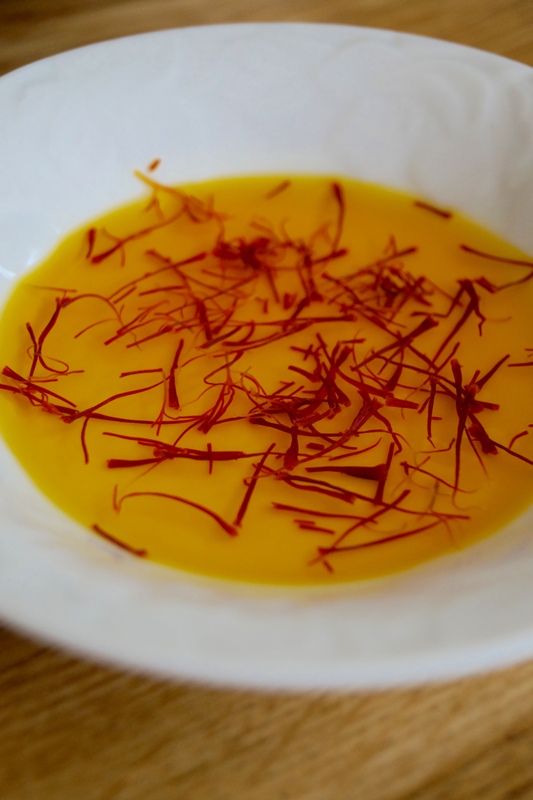 Saffron is one of my favourite spices – I love the mild but special taste and gorgeous colour. Great tip about soaking the saffron. My brother brought me some saffron during his last trip to Spain and I haven’t used it yet! Can’t wait to see your paella recipe! The saffron flavor in this is probably so amazing, I can’t even stand it! Thanks Jocelyn! 😀 It tastes really great and is a family favourite recipe! Thanks so much Medha! You’d love this! 😀 Hope you do try it and enjoy the recipe! We use saffron in tons of Indian dishes 🙂 It’s one of my favorite spices, the rice looks wonderful! i love how fluffy this looks!!! Oh I love the colors of this rice, Jessica! It looks so flavorful. I think I could make a whole meal out of this! Saffron rice has been on my must-make list for FOREVER now and I’m definitely gonna have to make it happen after seeing this! It’s gorgeous, Jess! Thanks so much Sarah! You really must make it for your blog too! 😀 Glad you like my recipe! I absolutely love your recipe! Thank you so much for sharing! This rice is perfect ! Need to try this method of cooking, love the flavors!